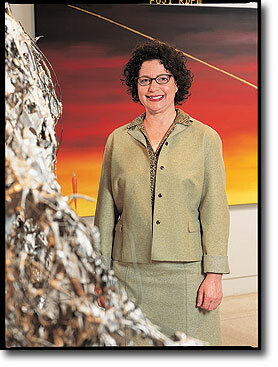 Betti-Sue Hertz is curator of contemporary art at the San Diego Museum of Art. She also works as an independent curator. Recent projects include Vistas Nuevas: Recent Videos from Cuba, The Kitchen, N.Y.C. ; and Analogs of Built Space, The Sculpture Center, N.Y. Hertz served as Director of the Longwood Arts Project (1992-1998), and co-directed 1990s Art From Cuba: A National Residency and Exhibition Program (1997-9). She was Director of Special Projects Bronx Council on the Arts from 1990-91 where she directed The Casita Project and curated Las Casitas: An Urban Cultural Alternative exhibition for the Experimental Gallery, Smithsonian Institution, Wash. From 1985 to 1987 Hertz was Executive Director of the Bronx River Art Center and Gallery. DC: As a curator of contemporary art at the San Diego Museum of Art, you work right at the intersection of Mexico and the US. You are able to move freely back and forth across the border between the two very distinct urban landscapes of Tijuana and San Diego. How would you describe the two cities? How do they compare and contrast? BSH: San Diego was part of Mexico until the war in 1848. It has only really existed as part of the US for 150 years, which in European terms is not very long. This region has probably been inventing itself as being separate since then. So, there is a historical road map that is already very complex. Tijuana, on the other hand, is a frontier town, which is very far away from Mexico City and very close to the US. Tijuana and San Diego have grown up to be very different types of cities. San Diego is very wealthy. Not that everyone is rich, but it is generally a wealthy area in terms of its resources, and in terms of the general standard of living. Tijuana is a much more urban place. It has an enormous industrial/economic base, which is very different in terms of its density, in terms of its problems, in terms of the kinds of things that people do there to make money, than San Diego. In some ways it is very harsh to go from San Diego, which is so suburban to my mind, to Tijuana. California, especially San Diego, is very regulated and very controlled from City, State and Federal government. Tijuana is more anarchistic and has a more chaotic and dense feeling. For INSITE 2002 Arturo Cuenca made a billboard You are Aqui, which was essentially a map of the border. You could see that Tijuana is very dense, especially around the border area. In San Diego the density around the border is quite light compared to 15 miles north. It is as though Tijuana is pressing up against the border in a very physical way. There are huge amounts of migration coming in from the south into TJ all the time. There is a saying here, that is sometimes true and sometimes not, but used to be very true, that San Diegans turn their back on the border. They want to deny it and erase it. It is true that there are a lot of people who live here who have very little contact with Mexico. However, I also want to say that there is a lot of permeability. There is a lot of familial fluidity. A lot of families live on both sides of the border, in the southern part of San Diego County in particular. There are a lot of other ways that Mexico permeates into San Diego because of the maquilladores. Many of them are now Asian owned, so there is also this other interesting Asian overlay to the part of the border that is permeable. DC: What is the relationship between the art scenes of San Diego and Tijuana? BSH: There have been attempts on the behalf of some people, both in San Diego and Tijuana, to build relationships. All of the border art organizations, from the Border Art Workshop to inSITE, set the tone for a bi-national dialogue. The San Diego Museum of Contemporary Art has programmed a number of artists from Tijuana. They exhibited the artist group ToroLab, a young artist called Tania Caniani, and they do some cross border programming. There is a professor here at UC San Diego in the Visual Arts Department called Louis Hock who was involved with some of the earlier projects in the 80s, and who still does workshops, and is very interested in the cross border dialogue. I am on the curatorial advisory board of the CECUT, and I am also here at this museum, so I have the ability to move back and forth in terms of recommending artists, or bringing artists for certain programs. There are a couple of alternative exhibition spaces that have made some effort. There are also architects working on both sides of the border as well as people working in documentary video for example, and in other areas such as music. Nortec has perhaps had the most fluidity. They are able to circulate, because it is easier for music to circulate than visual art.